Answer: Yes, it is. Connecting to the Internet from a boat can be tricky. While the process gets easier and cheaper as technology advances, we still must deal with the challenge of connecting something land based to something floating around in the middle of nowhere. Even the most shore-fixated boat is rarely connected to anything more substantial than a dock cleat. How you get online depends on where you are and what you need to accomplish: On shore you do your bulk, multi-media transfers; In or near a marina you conduct daily business with short posts, blogs and overnight downloads; Out in the middle of nowhere you connect for safety reasons. On Shore – Cruisers are the ultimate road warriors when it comes to on shore connectivity. 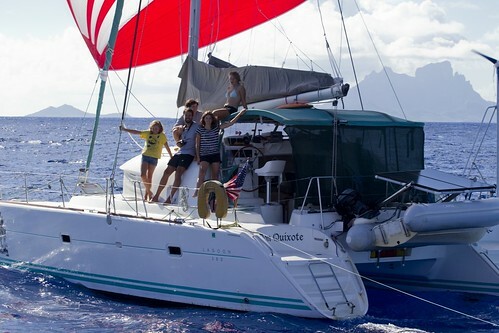 The crew of s/v Don Quixote grows increasingly adept at finding free wifi hot spots in the oddest spots. For example, did you know that you can sit outside of most Apple stores on a comfortable mall bench and mooch broadband? Starbuck's service is great now that all you have to do is purchase a latte. Of course, virtually every small coffee shop in the country now trumpets free wifi. Other great places to pull bits include: public libraries, rich homeowners with more money than security sense, and cool Internet hippies with “Hack the Planet!” and “All Your Base Are Belong to Mine” bumper stickers in their apartment window. “Internet cafe” is a redundant term in the U.S. where every cafe has Internet access. However, in other countries, this is precisely what you find – shops whose primary purpose is to offer broadband service. And “Oh... would you like a cerveza with that?” We've had little reason to seek out these types of establishments as we haven't yet ventured beyond the shores of the U.S. and Canada, but it's only a matter of time. We're very happy to hear the reports from other cruisers that these establishments are flourishing in every corner of the world. 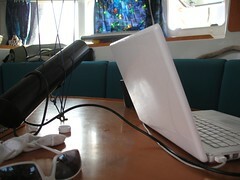 In or Near a Marina – As with coffee shops, it has become standard for marinas to broadcast wireless service out over their harbor. Most subcontract to ISPs which provide coverage for a wide swath of coastline. For example, we currently subscribe to BBXpress broadcasting from most major and minor ports throughout Oregon, Washington, and southern British Columbia. You can subscribe daily, monthly or annually. They even have a reciprocity agreement with a provider down in California so it's not likely we'll need to look elsewhere until we cross into Mexico. 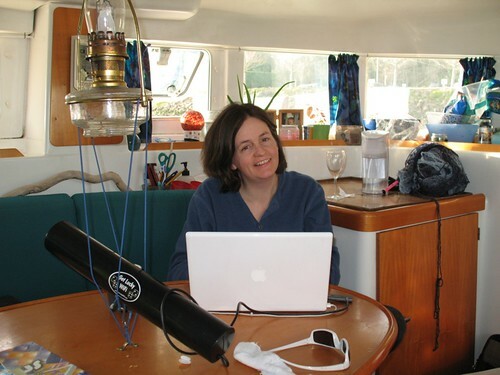 Using a marina service, it is a very good idea to invest in a card and/or antennae to extend your range and increase the power of your laptop card. We recently purchased an Edimax card from Urwifiguy. Look, you can clearly buy more powerful sets, run line up the mast, and make the whole thing bullet proof. I'd argue, though, that tech changes so fast you are probably better off buying a cheap, adequate set today and upgrading to another, better version in 18 months. You'll still spend less than the “marine hardened” brands. Out In the Middle of Nowhere – There are really expensive things you can do to get a high speed connection to the Internet while you're bobbing out in the middle of nowhere. These solutions are highly appropriate for the merchant marine, the military, and people with more money than god. They are not particularly useful or affordable for the rest of us. Moreover, spending the money isn't really necessary. Something like 95% of a cruiser's life is spent bobbing at an anchorage where a little elbow grease and a good war driving antennae will get you decent service from the comfort of your salon. So for those odd passages and occasional times where you really must connect while out of reach of somebody else's wifi router, the solution is SSB, a Pactor modem, and a crappy piece of Windows software which hooks you up to AirMail. While the bandwidth is absolutely bad by modern standards (2200 kbps is a good day), the computer <=> modem <=> radio option works well enough to send and receive critical messages and to download weather data. We are just starting to use our rig, and the thing more or less makes me want to take out a hammer and go postal. The only method I've found to endure the limits of the WinLink software and glacial speed is to pull out a bottle of red wine and disappear into my cabin until the damn thing is done. We plan to use radio mail to send a daily position and status tweet to Twitter or Jaiku and otherwise pretend it doesn't exist. There is also good news on the horizon for those who, like me, hate paying monopoly rates to SCS Pactor for their proprietary protocol. Open source alternatives to enable radio to Internet communication are beginning to spread. I am watching with great interest the growth of both Xastir and PKSMail. Someday, I may pitch this Pactor modem overboard and just get my Mac to cozy up directly to the SSB. The bad old days of cruising families disappearing into the sunset ne'er to be heard from again are long gone. If you want to exchange tweets with friends and family, daily connectivity is within the reach of any moderately well heeled cruiser. And there is something to be said for sailing into harbor, grabbing a beer and a bowl of chips, and gorging on Diggnation, Wait Wait... and MacBreak Weekly all in a single sitting. * Is there are more sad attempt at a merged logo than FedEx Kinko's anywhere in corporate America? If all you're looking to do is leave a position marker and status update, have you considered SPOT? @protected static - I've been watching this with interest. There is no question were I to go on any land adventure, I'd buy one in a heartbeat. For boaters, there are two limitations to this: (1) doesn't work in the middle of the ocean... check the coverage; and (2) doesn't download weather data. I think this company is 100% on with this product, however. I saw it demo'd at the boat show and was VERY impressed with the quality and the people representing it. but if you know where you're going to be next, they're good for making a battle plan. It's "All Your Base Are Belong to Us", but that's OK we'll let that deep-dive into nerdom slide :-). Thanks for this article. As we prepare for our trip to Mexico next fall and winter (Baja Haha 2010), I was curious what you did beyond the obvious wifi hotspots - since you have such great updates and frequent posts. THANKS!